Eurocopter EC120 B c/n 1301 was registered D-HJMB in Germany with Euroheli Helikopterdienste / Helirotate GmbH. On 7 March 2003, the 2002-built Colibri was substantially damaged in an unsuccessful autorotation landing during a check-flight at Herzogenaurach airfield, Germany, when the main rotor blades struck the tail-boom. 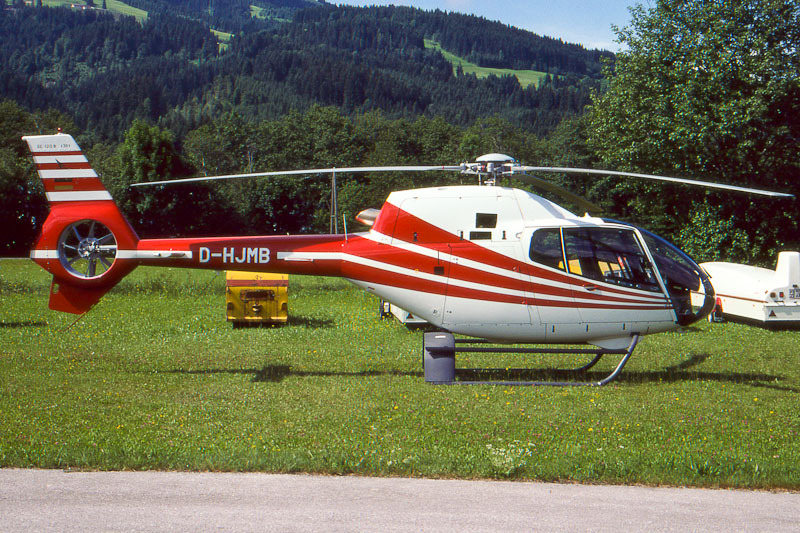 The helicopter was rebuilt and returned in service as D-HJMB with Helirotate GmbH. On 1 December 2005, registration D-HJMB was cancelled and the EC120 B was registered in Kazkhstan as UN-LA-125. On 31 january 2008, the helicopter was re-registered UP-EC004 with Sky-Service, Boraldai Airport, The Republic of Kazakhstan. Today, Eurocopter EC120 B UP-EC004 is no longer operated by Sky-Service and is offered for sale. Eurocopter EC120 B Colibri D-HJMB was seen at the airfield of St. Johann in Tirol, Austria, on 8 June 2002.